Pored M12 najčešće se koriste M8 konektori. Kao i za M12, raspoložive su sve varijante sklapajućih, ili sa kablovima, 3, 4 pina. Četvrtasti konektori za aktuatore. Sa ili bez signalizacije, sklapajuće ili varijate sa integrisanim kablom. I/O box kutije (pasivne) sa različitim tipovima konektora, različitim brojem portova, vezom na višežilni kabl ili M23 konektor. For more than 30 years, the ESCHA Group has been developing, manufacturing, and marketing qualitatively high-grade connectivity and housing technology which are implemented in automation technology as well as in machinery- and plant engineering. 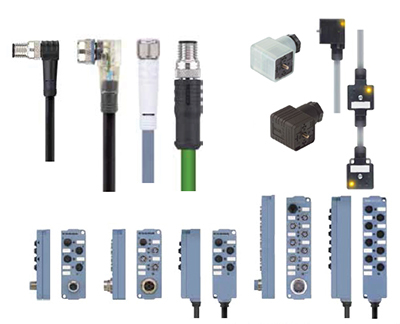 At ESCHA, you get all from one hand: innovative standard connectivity, individual and special solutions, and custom-made automation components according to protection classes IP67, IP68 and IP69. Take advantage of years of experience in connector-, housing-, and tool design, a professional project management , an efficient and modern tool shop as well as the certified production for injection molding, cable manufacturing, and overmolding technology. Through innovative strength and highly in-depth development and manufacturing, ESCHA realizes custom-made special solutions and customer-individual products on a daily basis. The group headquarters, development and production are based in Germany. With about 600 employees around the globe ESCHA generates an annual group turnover of 55 million Euros. Through a global sales network and production sites in Europe, America, and Asia, the company guarantees consistent product-, quality-, and service standards worldwide.